The Cat Eye Urban Wireless Plus cycling computer took the original and made it thinner, more stylish, and even easier to use. In addition to the standard ride data that one might expect, the Urban Wireless Plus now packs even more punch with a programmable odometer, menu screen, and backlight complete with night mode. With its included FlexTight handlebar mount, speed sensor, and spoke magnet, the Urban Wireless Plus installs easily on almost any bike from 27.5" and 29ers to road bikes. 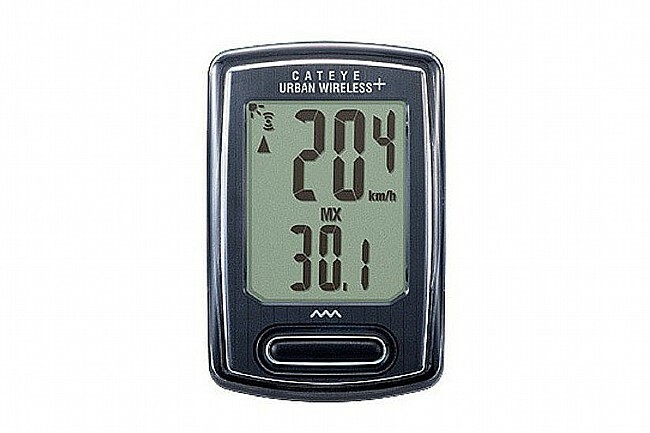 The Cat Eye Urban Wireless Plus Cycling Computer VT245W includes the Urban Wireless Plus computer, 2 CR2032 batteries, speed sensor, spoke magnet, and FlexTight handlebar mount. Menu screen to change settings.